This week I have been bitten by the sewing bug. The need to sew and stitch had been coming on for quite some time. I was reading Mollie makes. An interview with Dutch designer Marieke Voorsluijs of Club Geluk, where she shared her top decorating tip, "don't think about it - just make it," was enough to topple me into action. I would make a quilt, not a big and complicated quilt, but a smaller, more random one where I could experiment with what would be my first quilt, and how it all goes together. Started the evening before in my craft room, and then moved into a sunny spot in the living room to continue the next day. 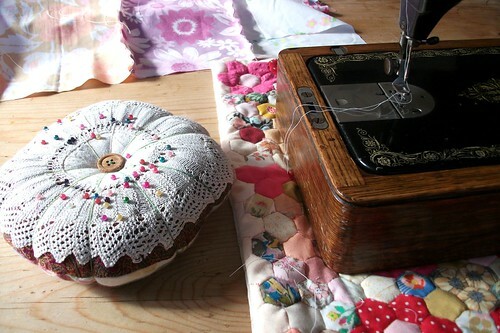 There I discovered there is nothing nicer than stitching together pretty pieces of vintage sheets, in the sunshine, with the doors open, and the sounds of birdsong wafting in! First I made panels, very randomly. Mainly by eye and without a cutting mat or rotary cutter, so matching up squares was not really likely! In my mind I had the idea of french seams. So after stitching and pressing, I turned over my panels and stitched them on top. I top stitched above the pressed seam. Now in my mind this may be a french seam, but I can't swear on that! It may be that the seams need to be pressed open and stitched on both sides. Or possibly top-stitching isn't necessary at all. Anyway, after ensuring my seams weren't likely to come apart ever. 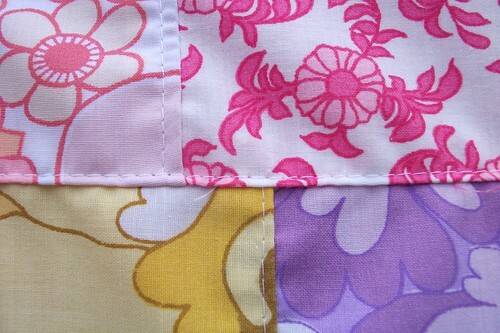 I backed the quilt with a very pretty and soft terry fabric. I'm happy to have found something to use this for, because it really rather lovely. I folded the edges over and under to make the bias binding and you guessed it, top stitched around this, securing it nice and dandy. I won't mention the corners other than to say there is definitely a corner trick I really want to learn! 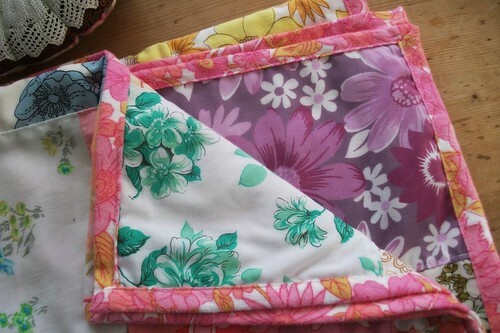 The idea for using the backing material for the bias binding came from the lovely, and colourful, Lisa, of mrsbobobun on her post here. She makes me want to sew. and sew I did. Here she is, done and dusted. Or should I say stitched and pretty. Ready to?...... well, I'm not really sure. She measures 80cm x 120cm. Maybe a small throw, or a little something for somewhere. She will find her place. I discovered that I love my pin cushion brought a few years ago at a craft market. It's big, which makes it nice to use. It can always be found. I discovered that using a pretty mini quilt, also from a craft market, under miss trissie helps her to slide easily around on the table as we cavort. I discovered that using my material cutting scissors for cutting up dog chews in the kitchen, wasn't a good idea. And that my Mum's lovely gold, vintage scissors need sharpening. How do I do this? And just maybe a purchase of a cutting mat and rotary cutter might be considered. I also love the perfumey smell of the vintage sheets when they're being ironed. A little strange perhaps but it reminds me of all the towels and sheets in my Mum's linen cupboard! 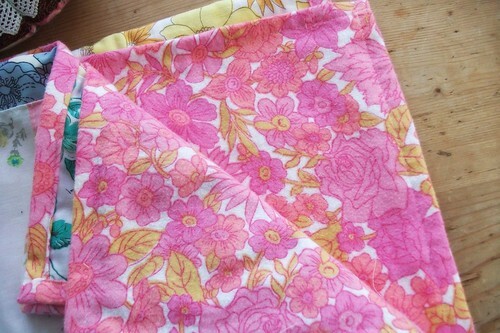 and it's been so nice to use my vintage fabric and actually work with it. I think a cushion might be next. 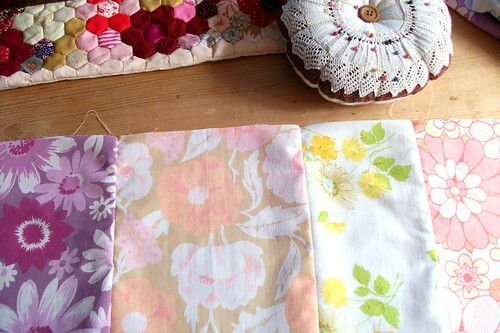 I have been pinning lots of vintage sheet inspiration here. Feel free to have a look. Right now there's a lawn that needs mowing! Are you trying any new crafts lately? 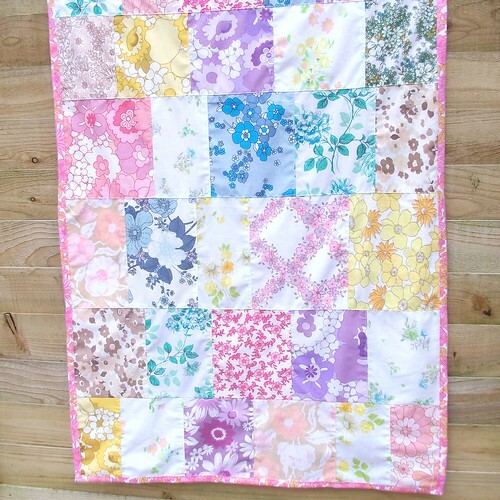 Hello lovely Heather, I love what you have done with this beautiful patchwork quilt. I love the combination of all the old vintage fabrics they all compliment each other so well and the bias looks great, thanks for sharing the tips there. As for scissors, eek! I have done the same and then tried to sharpen them with a knife sharpener, DO NOT DO THIS!! !, as they now live on a landfill site somewhere (sniff sniff). You should have a shop that makes keys and has all sorts of nic nacs that will sharpen it for you. I love your pincushion, it is so darling!! Also love your sewing space it looks fab. I look forward to seeing your cushions. Happy weekend xo p.s. rotoray cutter worth the investment! What a beautiful patchwork quilt! I would love to try and make one too. I love your quilt! I dont always measure before I sew and sometimes it all comes out just fine!I love the soft look of that terry backing - looks v cosy! 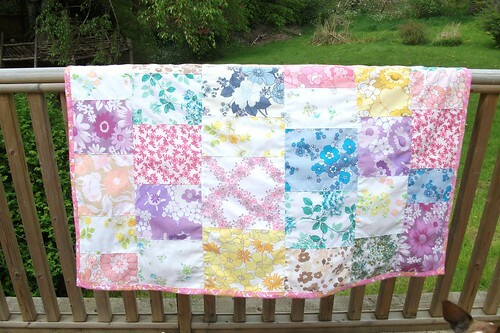 What a lovely quilt , i,m also a vintage sheet "lover"
i turn them into kids jackets it makes them look so cute. Heather, what a pretty first quilt. I'm so happy for you that you enjoyed the whole process. You will never look back if you invest in a cutting mat and rotary cutter, trust me!! What can I add??? 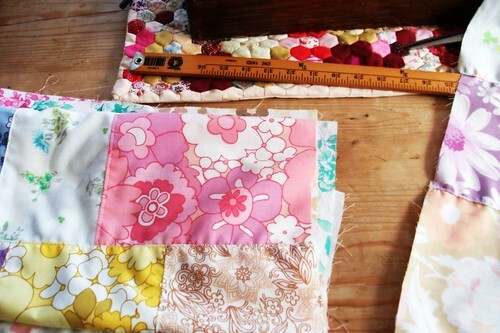 The fact is that you describe all the quilt process as a simple thing and now I would love to have a try!!!! What a lovely way to use those vintage sheets! We actually have a man who comes round the village sharpening knives and scissors! He pushes a cart around and calls out 'Any sharpening?' in a sing-song voice! I think I can actually remember that sort of thing happening when I was a child but not since then - until we came to live here!!! Ah Heather you've done such a lovely job there, and kept it so simple and straightforward - well done you! 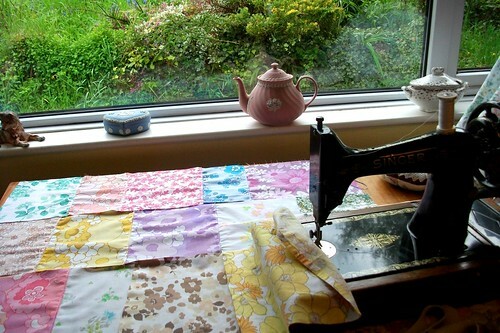 Your lovely sewing machine reminds me of my dear old Mum with her old treadle - and could she make that thing go! I really really love your little quilt, it's beautiful. 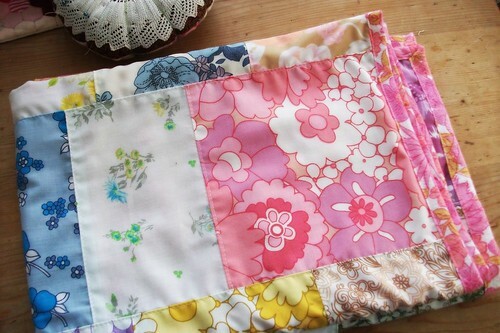 Hi There,Your quilt is bright,flowery and happy!! !Very nice!! !I think we all should do more and think less - just make it!!! !No Need to think about it for days, as I do sometimes,just make it!! !It will all work out anyway!! !Happy first quilt!!! Hope you have a super crafty and happy weekend!!! LOVE THIS!! Such gorgeous colors and patterns. And your first quilt?? Get out! A throw like that would be fought over in this household. This is amazing! Simply beautiful - here's to many more quilts! I really need the bug to bite me again...I have so much I need (want) to make. I love your quilt. I am liking your sewing machine very much and your creations from your sewing machine too! My friend swears by a rotary cutter and I think for accuracy they are probably pretty good - I am also more of a 'judge by eye' sort of person. 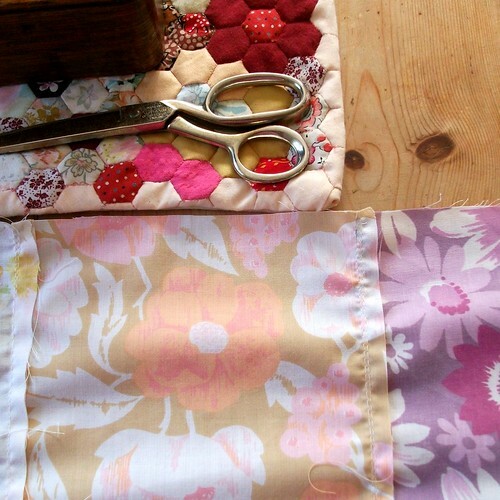 I love your quilt and the backing fabric is gorgeous!